25 Year 3 pupils participated in the half day visit. Their teacher was assisted by two classroom support assistants. The education officer led the activities while at the museum. Children were well prepared for their visit having spent some time in the classroom learning about Jewish beliefs and worship. The one and a half hour session started with a question and answer slot. As a result of the classroom preparation, children responded to questions enthusiastically. There followed a demonstration and explanation of some artefacts. Children were then able to explore the museum using self-guiding activity sheets and were assisted by staff. Of particular interest was the range of Torah scrolls in the Ark. Pupils relished the opportunity to dress in a tallith and kippah. Displays in the gallery offered insights into Jewish life in Manchester a hundred years ago, so giving a dimension of local history to the visit. The afternoon concluded with children participating in a demonstration of Shabbat activities. Teachers were convinced the visit gave pupils an opportunity to experience a different faith and culture from their own, so widening their horizons and understanding. The children certainly enjoyed the chance to learn outside the classroom. 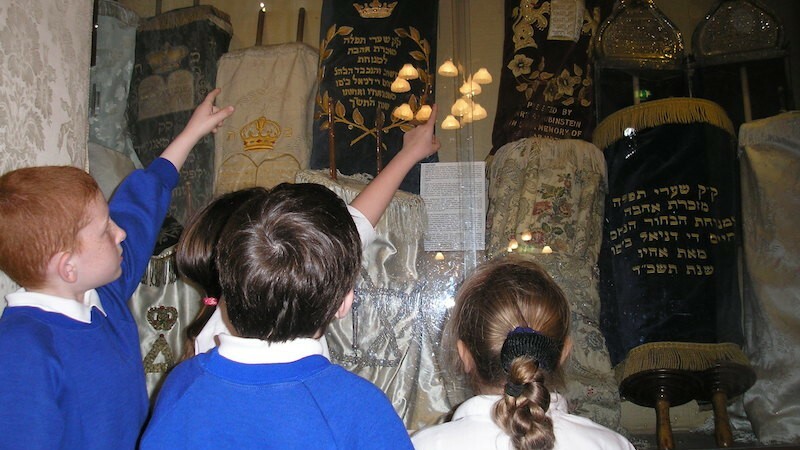 Many of the children were fascinated by seeing full size Torah scrolls and made the link with their religious significance. During the following week, a display table was set up in the classroom. The class discussed what they saw and learned. They led an assembly, sharing their experiences with other children in the school. Pupils in Year 3 started a ‘world faith book’ to keep a record of their exploration of faith and their feelings about it through their time at the school.